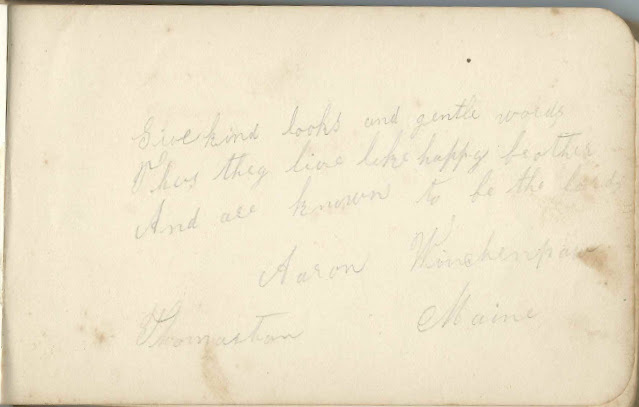 Autograph album with inscriptions by folks from Thomaston, Maine, and surrounding communities, and two from Massachusetts, but with a Thomaston connection. Most of the inscriptions were made in the 1880s, with several from the 1890s and two from 1918. 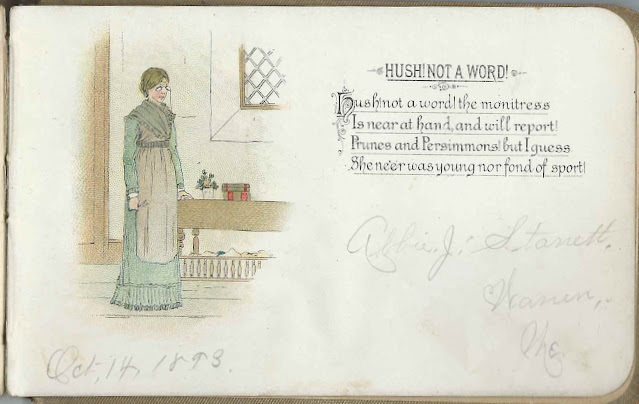 The album measures approximately 6" by 3-3/4" and contains illustrations throughout, as well as the sentiments of 18 people from Maine and Massachusetts. An alphabetical surname list and an alphabetical list of the inscribers, together with any personal information they offered, appear at the end of this post. Many of the people appear to have been related. There's no owner's name in the beginning of the album, nor is any inscription directed to a person by name. 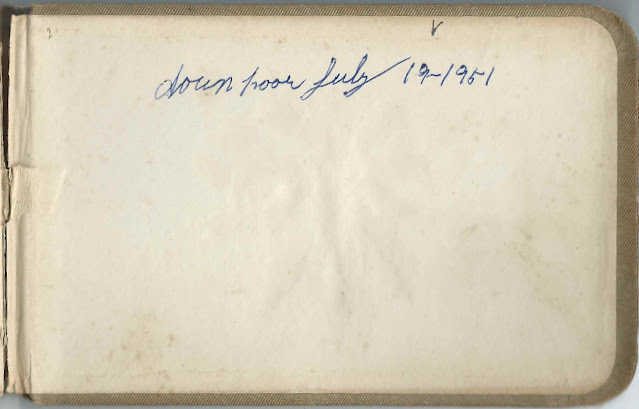 The first inscription in the album occurs several pages after the title page and was inscribed by Irene M. Robinson of Warren, Maine, on January 11, 1886. 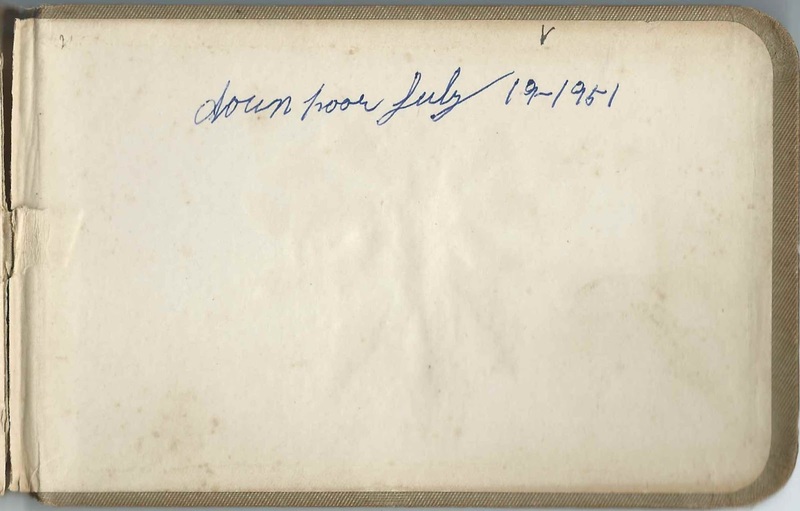 This does happen to be the earliest inscription in the album, whether that is a clue to the owner's name or not. 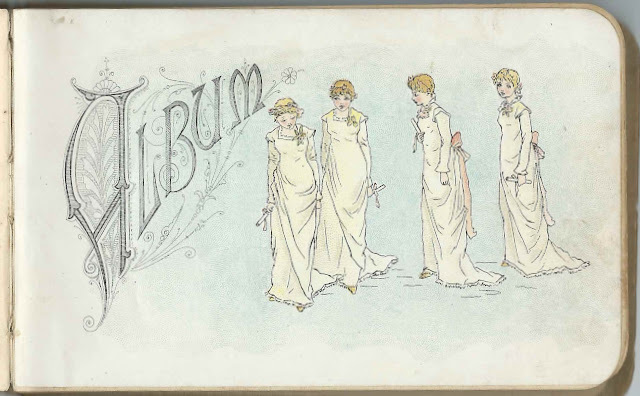 It's tempting to think that the facing pages inscribed in 1918 by Willis John Winchenbach and wife Adda (Murray) Winchenbach of Whitinsville, Massachusetts, might be another clue to identity of the album's owner. Willis was a Thomaston, Maine, native. Willis had several siblings, one of whom, Alton Winchenbach, inscribed a page in the album, so he can theoretically be ruled out as the album owner. Willis' other siblings were Everett Otis Winchenbach; Mary Vinal Winchenbach; Hazel Winchenbach; and Lewis Winchenbach, one of whom might have been the album owner. 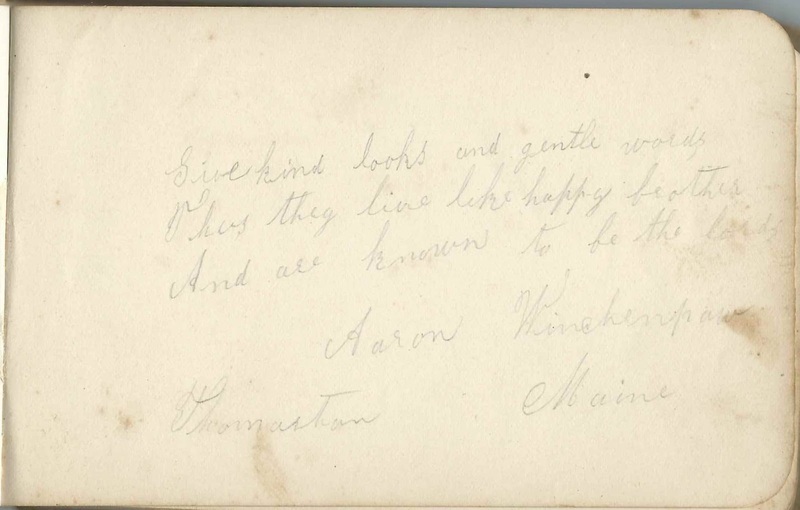 I'm wondering if the Aaron Winchenpaw who inscribed a page, was actually the siblings' father, who used a variant spelling of the surname. 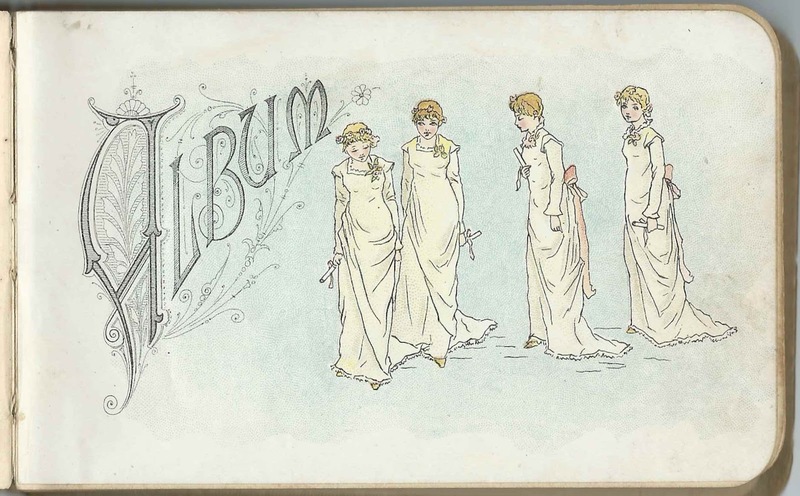 If so, his daughter Mary Vinal Winchenpaw, who inscribed a page, might be another of Willis' siblings, and thus can be ruled out as the owner of the album. The album resurfaced for use in 1951 when the owner, presumably, noted the downpour of July 19, 1951. Interestingly, Everett Otis Winchenbach lived until 1962. Winchenbach  Could this be a variant of Winchenpaw? Winchenpaw  Could this be a variant of Winchenbach? 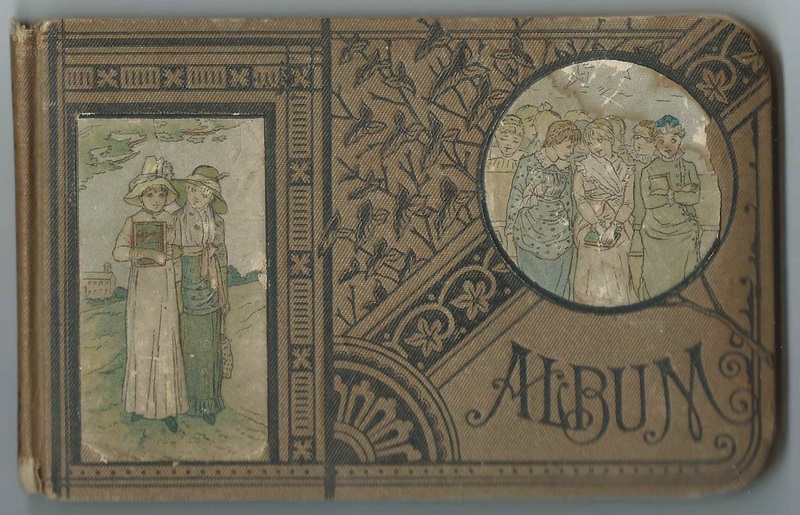 Abbie J. Starrett of Warren, Maine, used one of the illustrated pages for her inscription of October 14, 1893. Mrs. O. R. Pitcher of Thomaston, Maine; inscribed on September 29, 1893. She was presumably Eva Mary (Woodcock) Pitcher, wife of Oliver R. Pitcher. Mrs. Ada F. Vinal of Thomaston, Maine; inscribed on September 29, 1893. She was Ada F. (Woodcock) Vinal, mother of Harold W. Vinal, who inscribed the right facing page. Harold W. Vinal of Thomaston, Maine; inscribed on September 29, 1893. His mother, Ada F. (Woodcock) Vinal, inscribed the left facing page. Adda Winchenbach of Whitinsville, Massachusetts; inscribed on July 27, 1918. 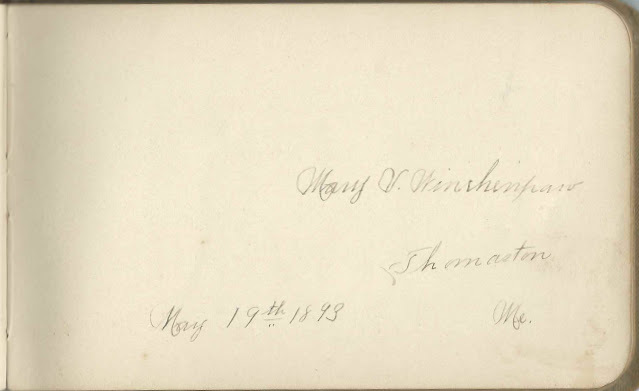 She was Adda (Murray) Winchenbach, whose husband Willis John Winchenbach inscribed the right facing page. Willis Winchenbach of Whitinsville, Massachusetts; inscribed on July 27, 1918. His wife Adda (Murray) Winchenbach inscribed the left facing page. Wow, this us very interesting. It would be awesome to have a collection of autographs by my relatives. Great idea.